This blog post was sponsored by Scotties, but all opinions and words are my own. Winter is not coming, winter is here. Being from a year-round warm weather city means preparing to survive winter that much more complicated. From drier skin to frequent sniffles, it’s something I’m challenged with every year. But this year is my third winter in NYC and I feel more prepared than ever. One thing I’m really proud of is how I’m setting up my home to be self-care friendly in spite of freezing temperatures. For starters, I got a hold on temperature control. Thank the city heavens for properly working heating pipes. However, there were a few window gaps and tinkering to do to make sure all systems were ready by connecting with my building Super. I also realized over the last few weeks that my living room was a little colder than the other rooms, so I purchased a small and affordable space heater. Bonus: blankets all around for those who are extra cold! 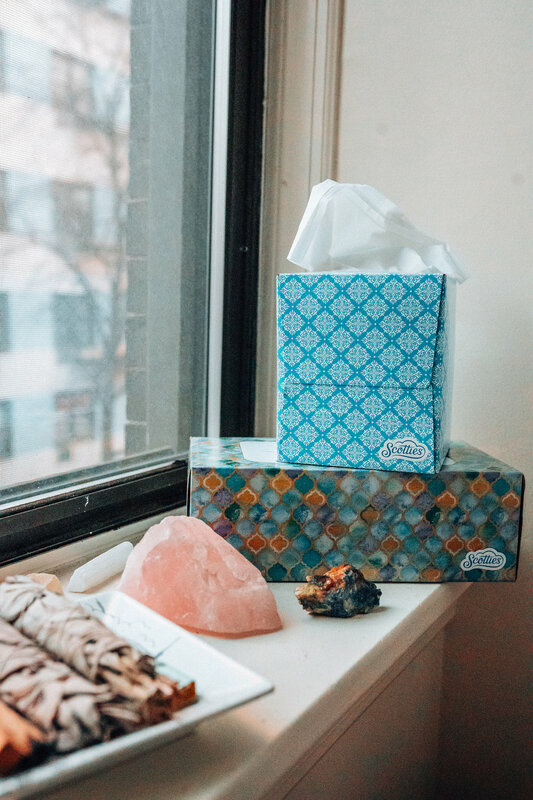 Next, I added touches of comfort throughout my space with Scotties’ new tissue boxes! They add a comforting touch of style when all the holiday decorations come down and blend seamlessly into my apartment’s aesthetic. You barely notice the fact that there are “tissue boxes” all around, and they’re easily accessible to handle any sniffle scenario. 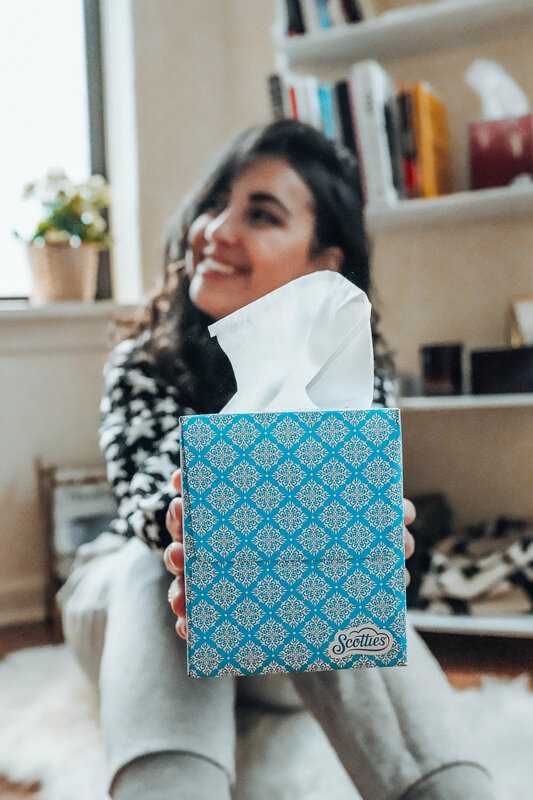 Scotties gives consumers everything they are looking for in a tissue, offering high-quality facial tissues at a great value with modern designs to fit in any room of your home. I added Scotties to my living room bookshelf, golden cart, bathroom and bedside in my bedroom. Fun fact: I’ve actually slept with tissues next to my bed for as long as I could remember. Waking up with allergies was no fun, but a comforting tissue always made me feel ready and relaxed! Finally, I’m harnessing the power of crystals for the second year in a row. “What do crystals have to do with winter? !” The anxiety and gloom of dark and cold winter months can easily get to you, but I find that working with crystals to give you balanced energy is a great compromise. There’s a lot to it, and I feel to beginner to be the one to give this a well-deserved explanation, but exploring this space has helped keep my spirits at their high during this crazy season. What are some things you’re doing to help keep you happy and healthy during the dreary winter months? Happy #selfcaresunday!